1. 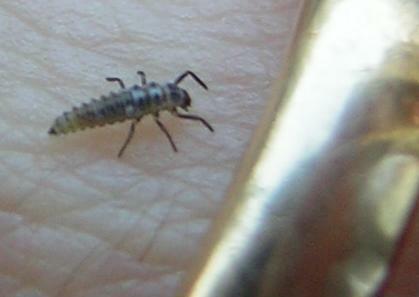 Scale - the ring is 3 mm wide, and gives a good impression of just how small the larva is. 2. Many of these photos show the larva on my hand because it's an active insect that seldom stayed put on a leaf during photo sessions. I know that in-hand photos aren't as useful for ID as those showing the insect in its natural habitat, but for this captive-reared individual, its container (and my hand) are its habitat. Plus, there are very few larval images of this species on the Guide, so I believe these photos are valuable regardless of location. 3. My camera's not very good, and doesn't focus well on small, close-up subjects unless some human body part is nearby. Until I get a better camera, I'll sometimes be in the picture.